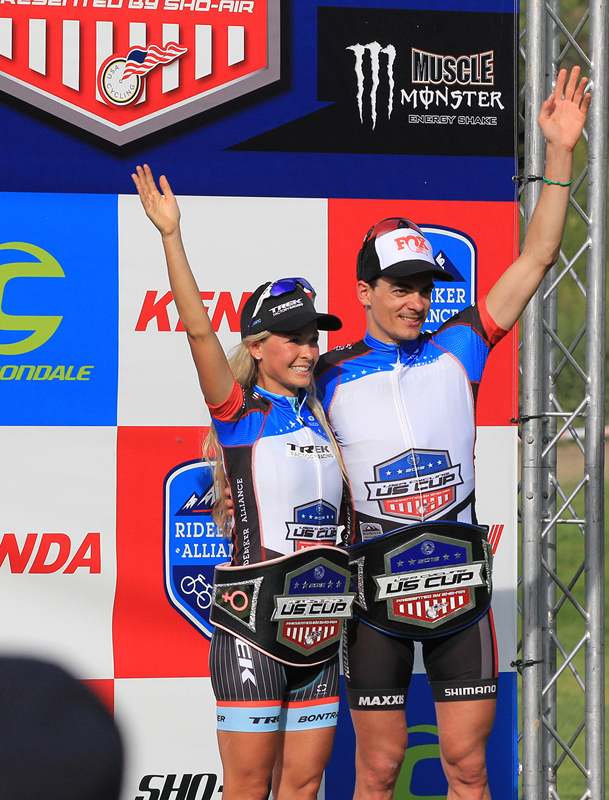 Canada dominated round 1 of the USA Cycling US Cup Pro Series presented by Cannondale at Frank G. Bonelli Park in San Dimas, California, on Saturday afternoon. Canadians finished 1-2 in both the women's and men's races, with wins by Emily Batty (Trek Factory Racing) and Raphael Gagne (Rocky Mountain Bicycles). The opening round was greeted with clear sunny skies and temperatures in the mid-30's Celcius, making for a hot, dry and dusty day of racing at the highest level. The women got things underway after a series of amateur events and the action heated up quickly. A fifty-plus size field took off from under the Kenda arch and it was world champion Catharine Pendrel of the Luna Pro Team who took the holeshot and the early lead after the short start loop. A Luna-led front group of five slowly peeled away and separated from the pack, only to be joined by the day's revelation, Larissa Connors on lap one. The Southern-California based high school math teacher soon found herself racing with World Champions, World Cup winners and Olympic medalists. Connors (Ridebiker Alliance) would at times prove to be the strongest climber of the front bunch, but would occasionally drop back from the leaders only to fight back over and over to bring them back after falling off the pace. Luna's Georgia Gould put in a hard effort towards the top of the first major climb of the day, which settled the formation of the front group of six, including Pendrel, Gould and Nash (Luna Pro Team); Emily Batty (Trek Factory Racing); Chloe Woodruff (Team Stan's NoTubes-Niner) and Connors (Ridebiker Alliance). 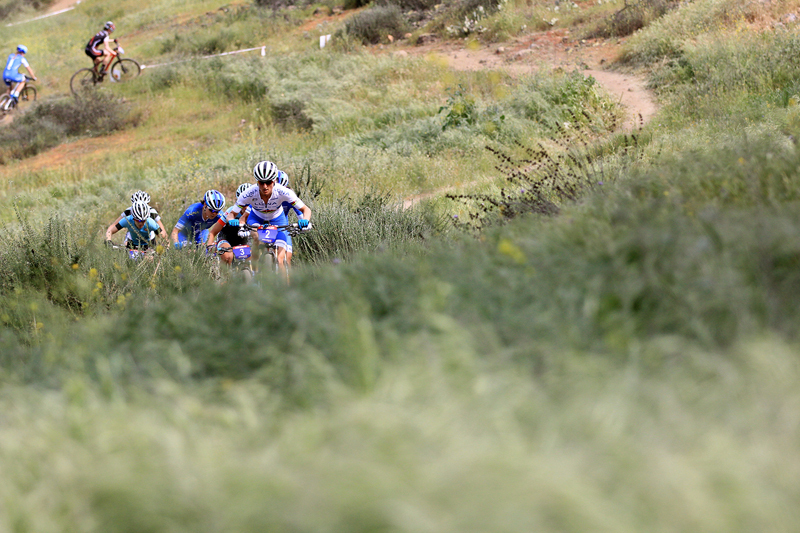 Behind them, the chase was led by Evelyn Dong (Sho-Air/Cannondale), Lesley Patterson (Scott Bikes) and Lea Davison (Specialized Factory Racing). On lap three of the seven-lap race, Nash and Woodruff would drop off the front group after pressure from Gould and Pendrel, with Batty calmly sitting in and Connors continuing to battle back to the leaders. 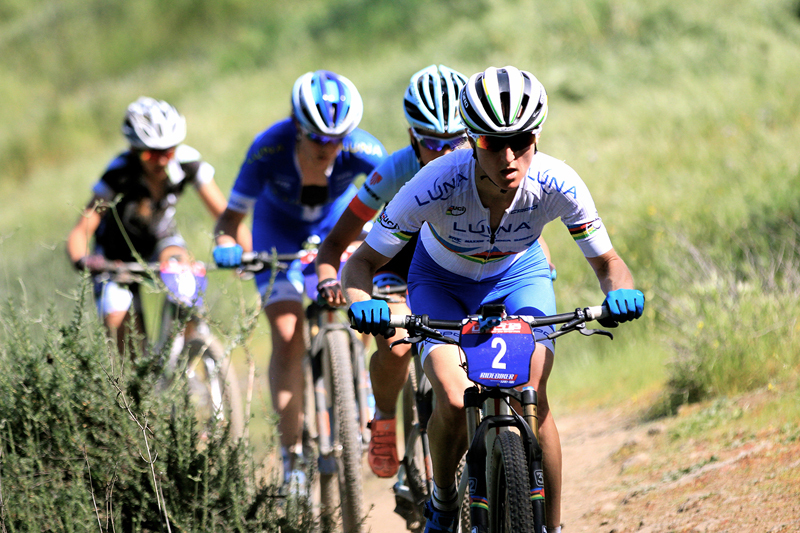 The race settled into this rhythm with little change until the final lap, when Batty finally made her move on the first ascent after the line. Putting in a strong attack, Batty got the gap needed and continued to put pressure on Pendrel for the remainder of the race to finish with a 39 second win over the current World Champion Pendrel, with Gould in third, Connors in fourth and Woodruff in fifth. "What an awesome start to the season," said Batty. "I worked really hard over the winter and spring. My confidence is there, my Trek equipment is dialed in, so it's really motivating knowing that the hard work paid off. The Luna girls are always 'on' so it's always a challenge and it defines that level of competition!" 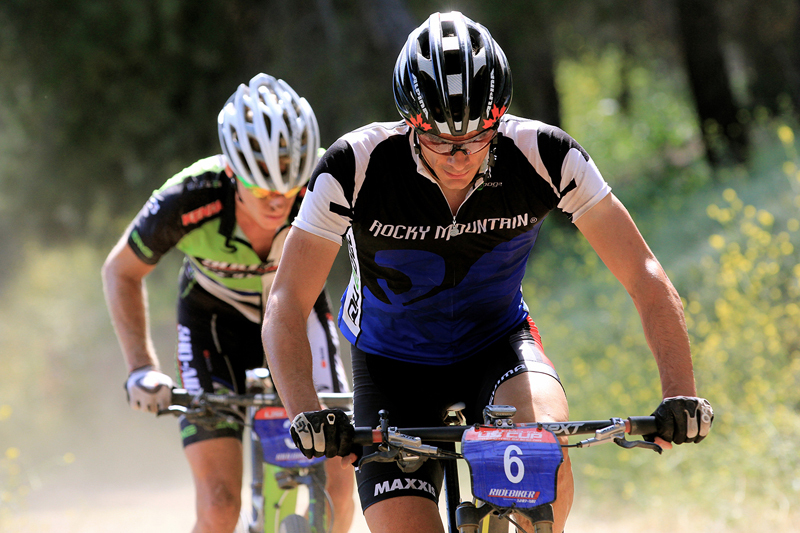 The men's race was shortened by a lap due to the heat and would also be seven laps of the tough Bonelli Park course. With temperatures already topped out, the men set off, as Italy's Andrea Tiberi got the holeshot and fellow Italian Marco Aurelio Fontana (Cannondale Factory Racing) took over the lead on the first full lap. Fontana's teammate Manuel Fumic then took the lead and, for a brief moment it was Cannondale Factory Racing in first, second and third, as Anton Cooper (New Zealand) benefitted from a strong start to claim his spot near the front. 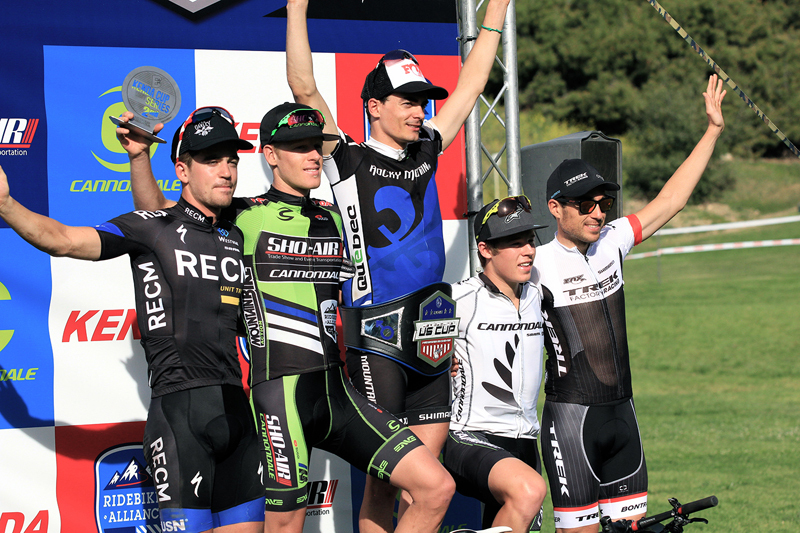 2014 overall US CUP champion Geoff Kabush (Scott-3Rox) slotted into fourth with Kerry Werner (Raleigh Clement Cycling Team) ensuring an American spot in the top five. Just into the second lap, Fumic put in a hard effort to get the gap he wanted, with Gagne trailing at fifteen seconds. Behind, Sergio Mantecon (Trek Factory Racing), Cooper and Fontana, Todd Wells (Specialized Factory Racing), Kabush and Werner formed the chase group. On the second lap, the chase group slowly reeled in Fumic, who was caught first by Gagne and then by the remainder of the chasers. With just two laps remaining, Max Plaxton (Team Sho-Air/Cannondale) put in an attack that only Gagne could bridge up to. The two would remain at the front for the remainder of the race to duel it out for the victory. Behind, U23-aged Cooper and James Reid (Trek RECM) joined up to defend their impressive positions against this top-flight field. Gagne's repeated attacks finally snapped the elastic when Plaxton was unable to bridge back on the short steep climbs of the final lap. Gagne pushed his lead out further on the final descent back into the park and had time to celebrate his twenty-second victory over fellow Canadian Plaxton. Cooper, Reid and Mantecon rounded out the international podium. 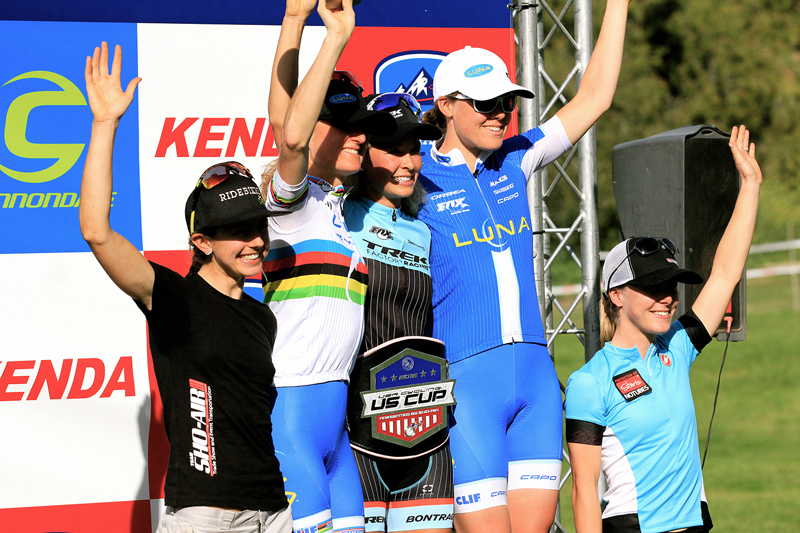 "This is my first ever cross country US CUP win, so I'm super happy with that," said Gagne at the finish. "I am here with Rocky Mountain and the Quebec Provincial Team, so thanks to them for the support. I found that little extra energy to catch back up to Max. He always has a lot of watts so it was good to be up there with him." "I felt comfortable in the big group and it was really dusty out there so I decided to take my own lines," said Plaxton. "My hat's off to Raphael, it's great to have a Canadian one-two. Thanks to America for putting on the race, but... sorry! Thanks everyone for coming out and cheering today. It was hot... but it was great!" After round one of five in the USA Cycling US Cup presented by Cannondale series, Gagne leads the series ahead of Plaxton and Cooper while Batty leads the womens' series ahead of Pendrel and Gould. The USA Cycling US Cup presented by Sho-Air Cycling Group series will continue with Round 2, a UCI Category HC race in Fontana, California on Saturday, March 21st.